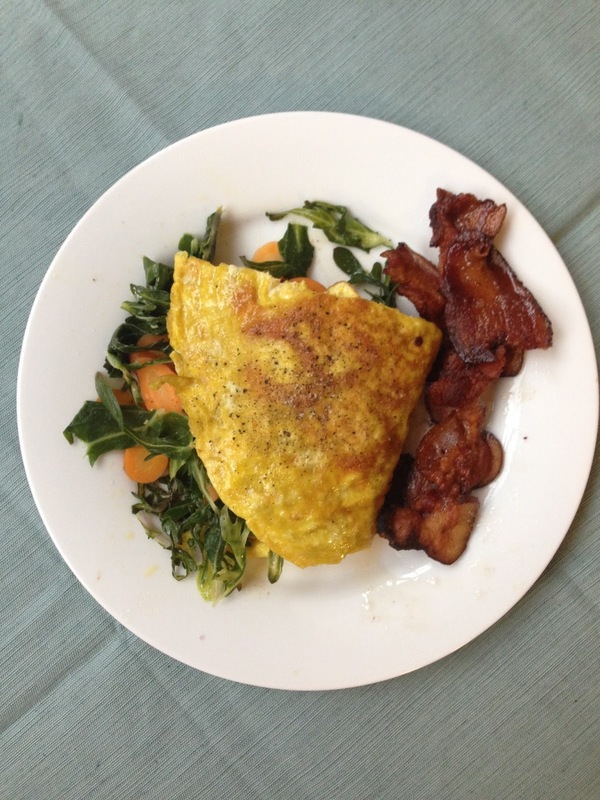 Grassfed Geek: We made bacon! 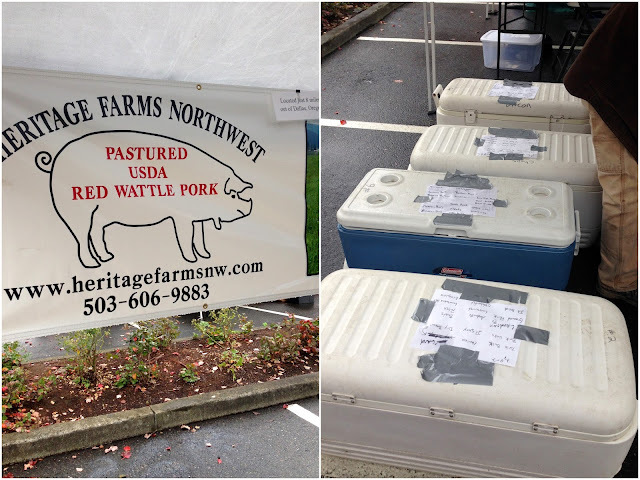 We recently bought half a hog from a local farm, Heritage Farms Northwest. We've bought cow shares before and purchased a whole lamb over the summer, but a hog was new territory. We got 137 pounds of pork (the farm does pastured Red Wattle hogs, a critically endangered species, and is one of the largest breeders of them in the US), including tens of pounds of fat (for rendering), bones (for making bone broth), and organ meats (for experimenting with when we feel brave). It filled two huge coolers and stuffed our freezers at home. Here's the farmers' market stand where we picked it up. We had given cutting instructions to the butcher for our half beforehand, and got to choose the thickness of the pork chops, size of the roasts, etc. We chose not to have any of the meat cured; rather, we asked to have the belly cut into several manageable pieces so we could cure and smoke it ourselves and make our own bacon. We got three 5 lb pork belly cuts. 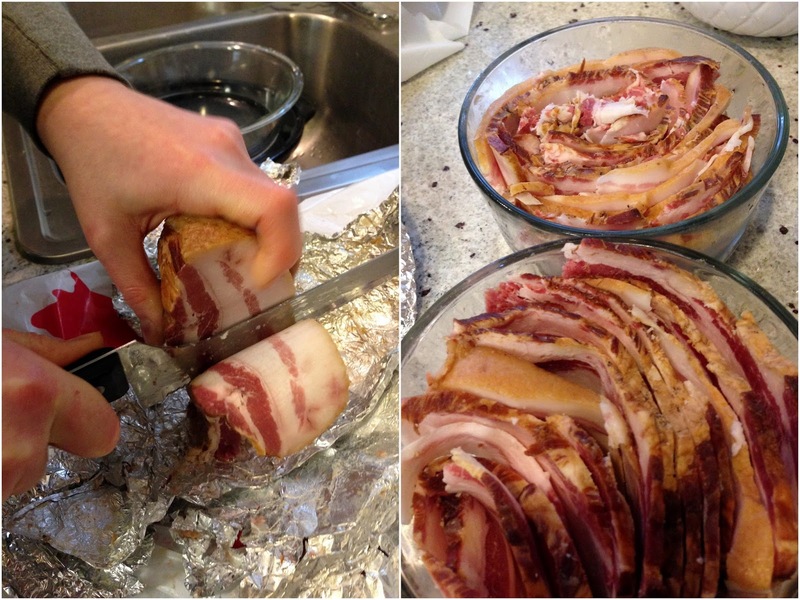 We'd read the recipe for making your own bacon (and smoker) in Beyond Bacon and had been wanting to try for a while. We tracked down "pink salt" (curing salt--this one is Instacure #1, sodium nitrate) at a food supply/equipment store in Portland. We used coconut palm sugar for sweetener, and a couple cups of regular sea salt for the rest of the salt. And some pepper. Followed the recipe! 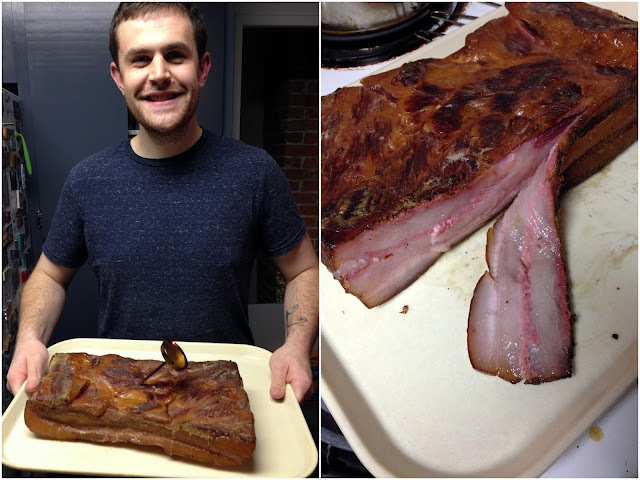 We cured the pork belly for 5 days in the fridge. Then we took it over to my parents' place; they have a big charcoal BBQ with a thermometer on the outside and several rack position options. My mom figured out how to set up the grill the right way using this thorough tutorial.) We smoked it at about 200 degrees (had to keep adding a coal or two, adding more hickory chips) for 4 hours because it was so large (the book said about 3 hours, for a 2 lb belly). Pretty intense, right? We sliced off the first slices when it was still pretty warm, and cooked it up for everyone to try. It was SO rich and delicious! Then we froze the whole thing. We figured it'd be easier to cut all the slices if it was mostly frozen. To cut the rest of it, we took it out of the freezer, let it sit out and warm up for a few minutes, and tried to slice it with a serrated knife. It's seriously so good. We've had it for weekend breakfast a few times now, and it's great. Better than any bacon I've ever had! And we know it's made with high quality ingredients! Love this! I have some pork belly from a butchering class that I took at Feast and I still need to make bacon from it, but I've been intimidated. Yours looks like it turned out so great! Yum, that bacon looks amazing! The electric knife sounds like a great investment for you both with all the meat shares/adventures you will be having. I don't have one myself since I don't really cook much meat with a veggie husband, but a couple we Thanksgiving with annually has one for the turkey, and it's amazing! Less scary in having to put a lot of strength into slicing, and nice even cuts. And again... that bacon looks fabulous! What a fun thing to do! Such an adventure in itself! Ah, bacon. Great job! You guys are brave. Enjoy the fruits of your labor. Wow - that looks yummy. 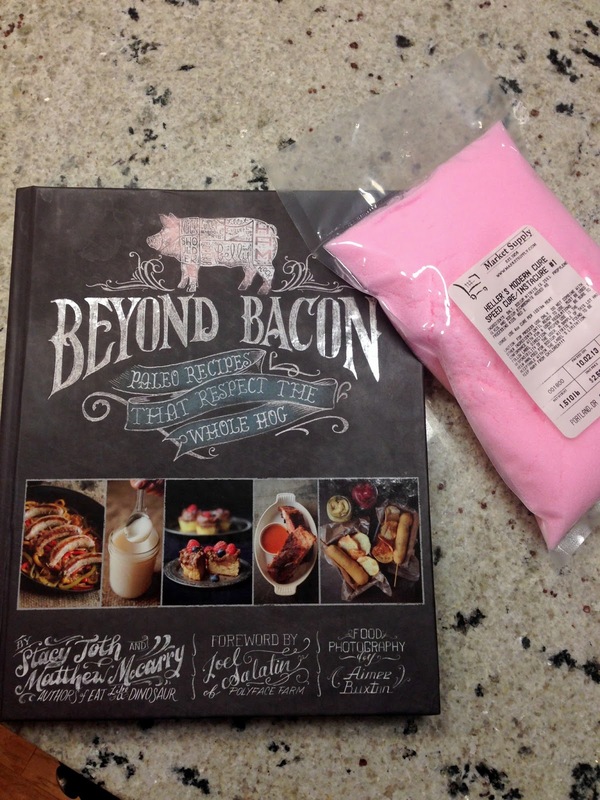 I have been searching for great bacon, and now I may have to try making my own. Thanks for sharing. That might just be the way to go, haha. We'd be slicing stuff all the time just to justify the purchase! It was definitely a solid first attempt, although there were some hiccups. Just go for it and it will probably turn out well. It's kind of hard to mess up bacon! I have this book and need to make this. Thanks for sharing your experience because I was wondering how the heck you could cut through a pork belly to make the bacon strips. 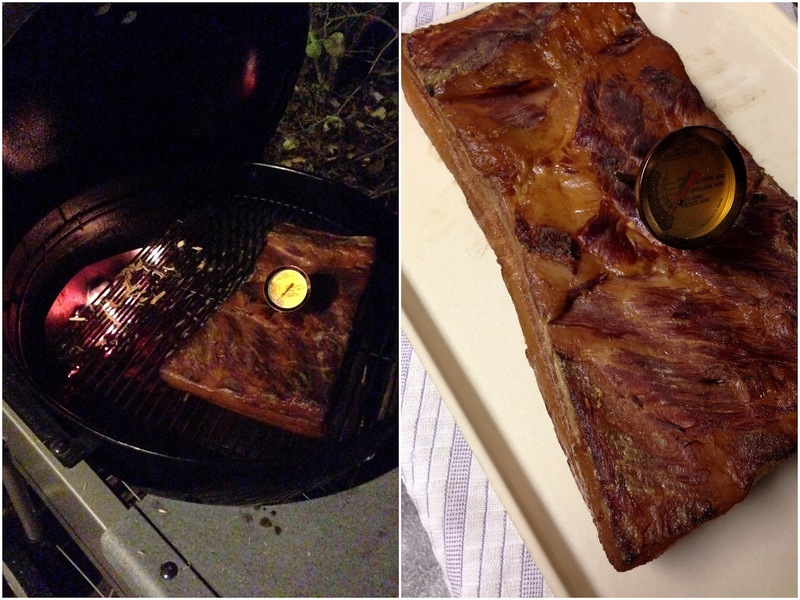 Have you tried the recipe for smoked pork belly? Crazy good. Wow - that does look really amazing! I also have the book but sadly don't have bbq to try it :( Looks delicious though!